“Four new wind farms and eight grid-scale solar farms came online between March and early May, with a total capacity of 1,030MW,” said author and energy expert Hugh Saddler. “The 500MW of solar generation will almost triple the grid-scale solar capacity of the NEM in just three months. “This demonstrates that the cost advantage wind had over solar has been reduced and we can now expect new capacity to be a mix of both technologies. South Australia has tipped into becoming a net exporter to Victoria, which is stunning. 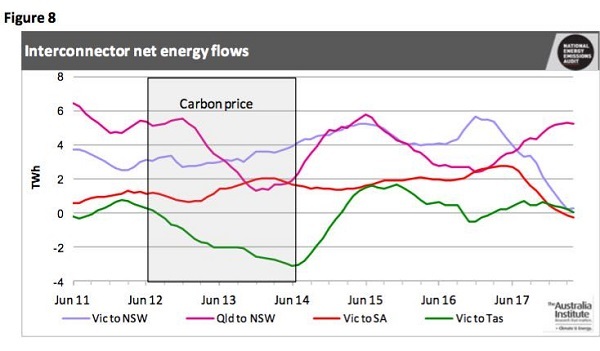 Victoria and NSW are now in balance, but the flow from Queensland to NSW is significant and increasing. 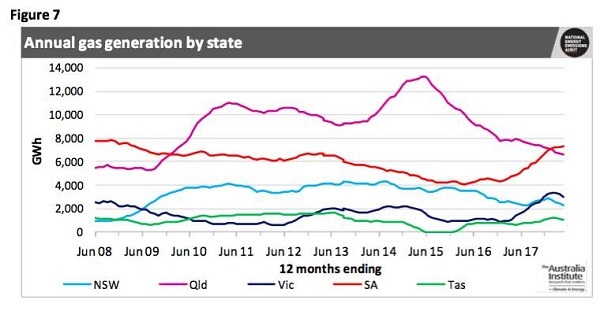 The following graph shows, as I’ve said elsewhere, that gas is being used most in Queensland and SA, and is plays a large role in balancing the grid. The problem child, however, is NSW where the update notes that coal-fired power stations have been consistently at 65% capacity. The AFR published an article on the weekend – Energy grid in crisis as winter power outages hit. Australia’s biggest aluminium smelter was bracing on Friday night for a third power disruption in four days, as a combination of cold weather, planned and unplanned power generation outages created a shortage of supply and sparked fresh calls for reform of national electricity market. Potlines at the Tomago aluminium smelter in NSW were taken offline on Tuesday and Thursday because of power shortages, and the smelter’s management was advised by its power provider AGL Energy on Friday of a potential similar squeeze on Friday evening amid warnings from the Australian Energy Market Operator (AEMO) of a “lack of reserve”. This was not meant to happen in winter. Tomago took a potline offline for 45 minutes on Tuesday, and two of its potlines offline for an hour each on Thursday. After that it takes three days to return the molten ore to a thermally stable state. The Australian Energy Market Operator said a combination of factors had created the supply squeeze in NSW, which saw 3800 megawatts of generation become unavailable in the network on Thursday and earlier in the week. After a busy summer period, some big coal-fired generators were locked in for planned maintenance, with about 1200 MW out of action. But another 1300 MW of unplanned shutdowns, combined with reduced capacity from other generators and some players choosing not to bid into the wholesale market, led to the shortfall which caused spot prices to soar. At one stage, three out of the four plants at AGL’s Bayswater power station in the Hunter Valley were out of action, while AGL’s ageing Liddell generator, controversially slated for permanent closure in 2022, was operating at a reduced capacity. Tomago Aluminium CEO Matt Howell is not amused. He wants coal, saying no smelter anywhere in the world runs on wind and solar backed up by batteries. I’m amazed that these people don’t know about pumped hydro or molten salt. A few weeks ago the owners of Victoria’s Portland aluminium smelter said renewables and battery storage would not alone be able to power the smelter when it power contracts come up for renewal in 2021. Part of Tomago’s problem is that when it signed the agreement with AGL back in 2010 they did not foresee the current state of affairs. They allowed interruptability in the contract to save them from spot prices. However, the current fragility in the market which is in danger of becoming the norm was then rare. As Giles Parkinson said, the recent troubles have been all about coal, so the Murdoch press did not fire up as it usually does if renewables are involved. All this came just after the energy bosses clashed with Josh Frydenberg on intervention. Ausgrid, Transgrid, online retailer Powershop and others have been complaining about intervention by government and regulators. It’s the scrapping of the Limited Merits Review, Snowy 2.0, threats of asset write-downs, and threats by the ACCC. Taken as a whole, they say, these interventions will inhibit investment, limit supply and in the long run drive up prices. Sounds like business as usual, with leadership form government either lacking or wrong-headed. The AFR published an article on the weekend – Energy grid in crisis as winter power outages hit. The SMH also published a similar article in Saturday’s paper edition, online article headlined Tomago Aluminium warns of ‘energy crisis’ as power supply falters, link here. The key point that I would like to get across is that the game is up— wind and solar photovoltaics [PV] have won the race. It is a lay-down misere. 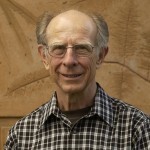 … The reason for this is that PV and wind are decisively cheaper than coal, even when one adds the additional costs to stabilise a variable renewable energy supply, such as storage, primarily in the forms of batteries and pumped hydro; stronger interconnection; and some spillage of wind and PV. That is the basic message I have. If you want cheap electricity you push renewables as hard as you can. to highlight Professor Blakers testimony and YouTube video 2017 CURF Annual Forum – Andrew Blakers keynote. I hope some of them get the message and act on it. I urge you all to draw your political representatives’ attentions to this message also. Can you risk not to do it? I can understand why Matt Howell wants to stay in a comfortable past where it was OK to run aluminium smelters on power made from fossil carbon and his smelter got cheap power because it had steady demand. However, it may be more productive for Matt to realize that the really cheap power of the future will go to major users who can handle variable supply and to start thinking about how to adapt to this. This may mean that Al smelters may run flat out in the middle of the day while using solar thermal with molten salt energy storage to stop the pots freezing during the night (but not running flat chat unless wind power is going strong. On the downside these changes may mean that the relative cost of Australian aluminium will increase and that aluminium will be replaced by other materials. 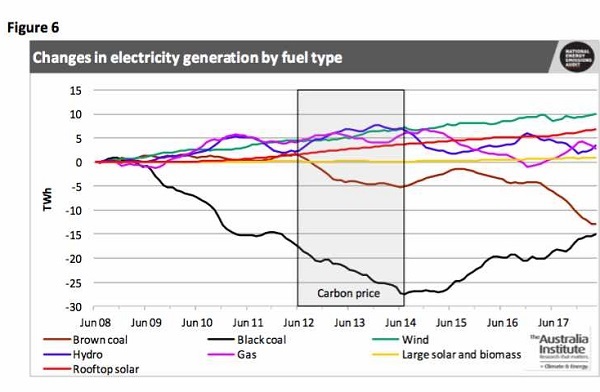 I can understand why Matt Howell wants to stay in a comfortable past where it was OK to run aluminium smelters on power made from fossil carbon and his smelter got cheap power because it had steady demand. I think Tomago Aluminium CEO Matt Howell demonstrates his ignorance and lack of imagination. Those people who recognize the new opportunities and exploit them are likely to survive. Those who stick firmly to the past in a changing world paradigm are at risk of becoming extinct – like the dinosaurs. ignorant and showing a lack of the imagination required to understand what the problems that the CEO of an established aluminium plant faces. Al smelters will maximize their profits by finding a very low cost source of steady power that is available 24/7. What Matt is facing is a changing world where there will be a source of very very low cost power for some parts of the day, in the form of direct solar PV and/or wind, but other times in the day when the cost of power will be too high for competitive Al smelting or simply not there at all. Battery storage is not the answer because, in terms of Al smelting, the cost is too high for the hours per day required. It may be that the problem might be solved by adding pumped storage to the system and/or solar thermal with molten salt heat storage. However, I haven’t got costs for these options but suspect that they too will cost too much for competitve Al smelting. Apart from get another job have you got any bright ideas to offer Matt? I take it there are very good reasons why Al smelters run continuously? Closely related to the physical properties of aluminium oxides and hydroxides? Thermal properties? Ambi: Not an Al smelter expert but the pots contain a molten salt that includes fluorides. I assume that there are operating problems if the pots freeze but I don’t know how long this takes or how difficult the restart is. There is of course the issue of lost production. “If a potline is shut down for longer than an hour it can quickly turn to custard, literally,” Mr Howell said. If a potline is shut down for longer than an hour it can quickly turn to custard, literally. After 75 minutes without power an aluminium smelter’s potlines start to “freeze”. After three hours without power they are damaged beyond repair. The replacement bill is $100 million per potline, and the risk of shutting even one down is a “$100 million decision”. When Portland shut down through unforeseen power failure the cost of repairs was reckoned at $240 million. Here’s the story of Tomago in February 2017. I don’t know how much flexibility there is with aluminium smelters. I suspect not much. They probably should have the same sort of priority as hospitals and fire stations. It sounds as if aluminium smelters are extremely vulnerable to power supply interruption, however brief. BTW Portland Al smelter was considered an important industrial asset for Victoria; it had a very long term and concessional power supply contract with the State Electricity Commission and its successors. I think its high tension supply lines were built especially for the smelter. A dedicated spur line, anyway. No doubt that infrastructure assisted other parts of south western Victoria too. In the AFR today Howell has said that when the electricity spot price hits $14,700 they lose $5 million per hour. So they shut down for short periods because that way the lose less. Ambi, my impression is that Portland is not a good place from an electricity POV. Too easily isolated. Brian: Sounds like there is a lot of bluster coming out of the Al industry which makes it harder to sort out what should be done and if it is worth continuing to support the Al industry if it is unable to take advantage of the very cheap surplus power coming from renewables. Can potlines be shut down safely for long periods by draining most of the metal and molten salt out of the potline. Can the power going to a potline be ramped down? How much can it be ramped down for long periods without putting the potline at risk? My guess is that there is some scope for short/partial shutdowns of Al smelters as part of demand management policies but we will have to wade through a lot of bluster to understand how much is avaialble. Hard to avoid the conclusion that Australian smelters that have depended on cheap baseload dirty power are not going to compete unless they work out how to take advantage of the very very cheap surplus power coming from renewables. Yes, very cheap in Victoria at least, John. But aluminium is such a useful metal…..
and there was all that bauxite, just up the coast at Weipa…. Ambi: There are plenty of overseas smelters that operate on renewable hydro-power or other renewable power sources. We used to use Tas hydro-power to make aluminium and ferro-manganese. I had forgotten the Tassie smelter. So why has UK “green steel” billionaire Sanjeev Gupta made a landmark agreement to provide cheap solar power to five major South Australian companies, promising to slash their electricity costs by up to 50 per cent? Why doesn’t Tomago Aluminium CEO Matt Howell have the imagination to do/attract something similar for his business? I would suggest it’s 19th century thinking for Howell. Not so GM, for example the first Aluminium production in Europe was done by Alusuisse which built a plant next to Switzerland’s mightiest waterfall at Neuhausen back in 1888, using its hydro power capacity. It is the ‘quick and lazy money’short term corporate thinking which is Howells problem, it is endemic and paints a bleak future for Australian Aluminium production and manufacturing of the same ilk. Howell appears to be one of these obstinate and destructive morons who don’t hesitate to kill off a major industry in this country for purely ideological purpose while having been on a gravy train for decades. Almost twenty years ago, the Australia Institute produced a report Subsidies to the Aluminium Industry and Climate Change. He really seems to actually believe what he is quoted as saying, here from the horses mouth. The large subsidies received by aluminium smelters in Australia are almost certainly contrary to the provisions of the General Agreement on Tariffs and Trade, especially as 79% of the product is exported. It seems likely that the Australian subsidies have not been challenged in the WTO because the same companies that dominate the Australian smelting industry also dominate the industries in the other producing countries. Thus a challenge would be a challenge by these companies against themselves, upsetting the global system of public subsidies the industry has managed to put in place. If the Australian Government were to mount a challenge on behalf of taxpayers and electricity consumers in Australia, a favourable ruling may provide legal grounds for State governments to escape from their onerous contracts with the smelters. Tomago was missing an opportunity because other heavy industry, such as Sanjeev Gupta’s Liberty OneSteel and Korean company Sun Metals’ Townsville zinc plant, are looking to solar and wind power, and batteries, gas peaking plants and pumped hydro storage to cut their energy costs. Seriously Australian corporate leadership need to get up to speed with technological and social developments or face a Kodak moment. That’s some seriously important information, Ootz. Corporate Australia has become almost totally reliant on subsidies to be profitable, or even just viable. That’s why Canberra is dripping with lobbyists. The Government loves this for market control reasons. Hear hear Jump (into my car), I cherish this rare moment of agreement. It’s is not just subsidies, but the tax avoidance enabling and royalty rorts, as well as rampant ecological and social irresponsibilities. Politically and economically we are led by self-serving ideological crooks. There is nothing wrong with lobbyists and corporate enterprise nor governing regulations, as long it is done on a sustainable and responsible basis – nation building not destroying. Stuff ‘growth’ if it resembles cancer. That’s excellent work Ootz. I was aware that the Australian industryhad been heavily subsidised and was struggling in relation to overseas competition, but didn’t know the details. Australia’s smelters are in the bottom 25% of global competitiveness. But once again, Mr Howell seems unaware of innovation in his own industry like that being pilot-tested at one of German producer Trimet’s smelters. “EnPot” technology allows a smelter to modulate its power use by up to 25 percent at the flick of a switch, according to Geoff Matthews of Energia Potior, which makes the kit. That not only opens up the potential for smelters to help manage electric grid flows, changing usage according to price and availability, but breaks one of the industry’s great technical constraints of having to run at 100% capacity all the time. “I think his board should be asking him why he is not contracting wind and solar,” Dr Mountain told The Australian Financial Review after the launch of the Victorian Energy Policy Centre at Victoria University. The AFR article was on page 6 of the printed version. Hopefully Mr Howell or someone associated with him would have read it. 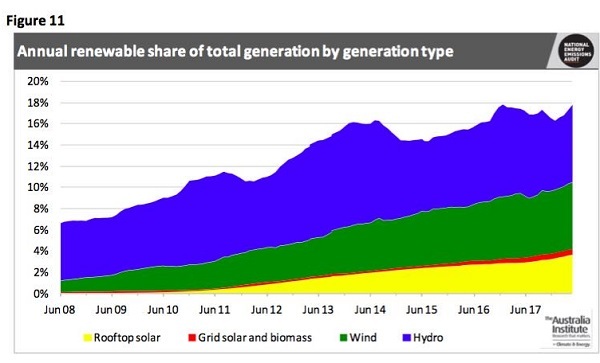 Please correct me if I have this wrong about the state of NSW electricity generation. It was a succession of NSW Governments, through tax-payer funds, that built and operated NSW coal-fired power stations – Liddell, Wallerawang, Vales Point B, Eraring, Bayswater, and Mt Piper. Yes? That the NSW Government continue to support the National Electricity Market to operate freely, subject to appropriate regulation. The NSW Government should not seek to invest further in electricity generation. That the NSW Government expedite the sale of remaining electricity generation assets. So what did the then NSW Coalition Government do? It sold-off all the NSW coal-fired electricity generators, with the blessing of the then Federal Rudd II (27 Jun 2013 – 18 Sep 2013) and Abbott (18 Sep 2013 – 15 Sep 2015) Governments. Wallerawang and Mt Piper were sold together to EnergyAustralia for $160 million in July 2013. Eraring was sold to Origin Energy for reportedly $50 million in August 2013. Liddell was reportedly sold for a token $1 to AGL in September 2014, as part of the deal to include Bayswater. Vales Point B was sold for a reported $1 million in November 2015 – the average price of a Sydney home. EnergyAustralia announced in November 2014 that it would close Wallerawang power station in 2015. Were there any objections from the Abbott government? None! Were there any objections from the right wing commentators? Not a peep as far as I can tell. AGL announced in 2015 that they intended to close Liddell in 2022. Were there any objections by the Abbott government? None! Were there any objections from the right wing commentators? Not a peep as far as I can tell. Then the “system black” event occurred in South Australia occurred in 2016, together with the announced closure of Hazelwood, and the rhetoric changed. AGL has repeatedly reiterated that it will close Liddell in 2022. Now Abbott and his cohorts want the Federal Government to compulsorily re-acquire Liddell, when Abbott and his government had no objections a few years ago for the NSW Government selling it off to a commercial entity. Go figure! BP Statistical Review of World Energy 2018 (67th edition) was released on June 13, link here. It’s a snapshot of world energy reserves, production, consumption, trading, primary energy mix, etc. in calendar year 2017. I agree. Ian Dunlop has been ‘banging on’ about this subject for more than a decade, see here. I think you, Ootz, and John D, haven’t provided any compelling arguments to the contrary. Renewables all have their down times. Not sunny? Not windy? Hasn’t rained for months? Not the right tide time? No big swell coming across the Pacific? And fossil fuels have their down times: boiler repair, regular maintenance, fire in the open cut, oil tankers didn’t arrive, oil refinery fire, Bass Strait on shore gas terminal fire, gas pipeline punctured. Tidal has a down time of less than 80 mins every 24 hours. Every aspect of tidal output can be predicted decades in advance. Short of human or mechanical failure it’s the most reliable source there is. I was merely pointing out that down time is not unique to ‘renewable’ power sources. How’s your planning for generating tidal power on a moored boat? My Sons and I are all flat out with work to get experimenting. My basic idea is a helical prop in a tube with collision and blockage protection, direction reversible and as simple as possible. After that, investigate a scaled up version that can accomodate multiple generators. Sort of like how an automatic transmission on a car works, under low flow ( ends of the tide ) a single motor is engaged and during full flow multiples are actively generating. Ah, the old “division of labour”. Son does calculations, father does grunt work. But why helical? Why not a screw shape like a wind turbine or a boat propellor? Archimedes was pretty good with water. Jump: The original propeller driven boats apparently had helical screw propellers. Then one of them lost part of the helical propeller and performance suddenly jumped. Ships have been screwed ever since. However, Archimedes screws are used for low lift agriculture pumping so maybe a screw would work. These helical screws are sloped with water only sitting in the bottom part of the screw. Wait you full report with interest. BTW: Tidal power can run 24/7 because tide times change as you move up rivers or around the coast. All you need is more than one generator. If you think about it you can also do things with more than one weir and generators on each weir. Archimedes was a top bloke and maths genius. Obviously also what we we now call a “physicist and engineer”. Love the stories of his crane to lift an enemy war boat until it capsized, and small parabolic metal mirrors to set an enemy sail ablaze. All defensive weapons against invaders. Thank Zeus he took my advice, closed his souvlaki stall, and devoted himself full time to maths! Give me a place to stand, and I will move the world. By the way, his short booklet “The Sand Reckoner” is well worth reading, in translation. Basically, he is inventing a way of writing (and conceiving) enormous numbers. We would now use ‘powers of ten’ for precisely the same purpose. What a mind: from agricultural low volume pumps, to astronomical numbers, to detailed mechanical and geometrical volume/area calculations, foreshadowing limit arguments and calculus (step out of the shadows, Leibniz and Newton). Yesterday, I attended as an observer the scheduled public hearing at the NSW Parliament for the Select Committee inquiry on Electricity Supply, Demand and Prices in NSW. I trust that the transcript of this hearing appears soon on the inquiry website, as there was some interesting revelations heard. I think the NSW tax-payers were right royally screwed on the sale of state-owned generator assets. But isn’t that always the case: Privatize the profits and socialize the losses? Materials circulated to the Coalition party room at the time also made it clear that Australia would need to reduce its projected emissions by around 900m tonnes in order to hit the 26% to 28% target. Methinks Abbott is attempting to re-write history over what he was signing up for at the time. The Hon. ADAM SEARLE: Vales Point power station was sold for about $1 million. What is its current valuation? Mr EVERETT: Its last value was around $720 million. The Hon. ADAM SEARLE: It was a pretty good buy for you guys. Mr EVERETT: For those that bought it, yes. The Hon. ADAM SEARLE: As part of that arrangement, did the State have to guarantee that it would purchase a certain amount of the electricity generated? The Hon. ADAM SEARLE: So you just sell it at large, to all customers. The Hon. JOHN GRAHAM: How much did you make last year, selling electricity into the market? Mr EVERETT: Last year it was in the order of $90 million profit. Greg Everett is the Managing Director of Delta Energy, that owns and operates Vales Point coal-fired power station. I think the sale of NSW generator assets is nothing short of scandalous! Now the Kidston hydro development has been granted a loan of up to $516 million in financing for the second stage of its project, the largest NAIF funding to date. However, it will still need to secure offtake agreements and grid connection before the NAIF board makes a final investment decision. Genex’s Kidston stage 2 development is the first major project to win funding since the government announced the overhaul of the NAIF after it was found its investment criteria were too restrictive, which reduced the pool of potential money recipients. The story says the loan has a term of 20 years. I wonder: might Minister Canavan’s job be to keep spouting coal bubbles, while the serious money moves across to renewable energy? Yesterday, Federal Minister for Resources, Senator Matt Canavan, was talking with Radio 2GB broadcaster Chris Smith, link to podcast here. I believe he also wrote an op-ed in yesterday’s The Australian (paywalled). The number one new generation technology being installed around the world is solar PV, number two is wind, and coal is a distant third. This year, roughly 200 gigawatts of PV and wind new generation capacity will go in around the world, while only 50 gigawatts of coal will go in. That is a difference factor of four between PV and wind and coal. Canavan and Blakers can’t both be right. Again, they both can’t be right. I, [Minister’s full name], do swear that I will well and truly serve the people of Australia in the office of [position] and that I will be faithful and bear true allegiance to Her Majesty Queen Elizabeth the Second, Queen of Australia. So help me God! I, [Minister’s full name], do solemnly and sincerely affirm and declare that I will well and truly serve the people of Australia in the office of [position] and that I will be faithful and bear true allegiance to Her Majesty Queen Elizabeth the Second, Queen of Australia. Before you start your evidence, the committee chair will ask you to state your full name and to take either the oath (sworn on the Bible) or the affirmation (a non-religious statement). You do not need to stand while you are being sworn. If you want a holy book other than the Bible, please tell committee staff before the hearing. Once again people are failing to talk about solar thermal even though SA is installing some of this tech. Solar thermal with molten salt heat storage and back-up molten salt heating can provide both baseload and slow response peaking power. Once again people are failing to talk about solar thermal even though SA is installing some of this tech. In May, I phoned the SolarReserve office at Port Augusta to draw attention to the NSW Parliament Select Committee on Electricity Supply, Demand and Prices in NSW and suggest that SolarReserve could make a submission. Also in May, I phoned the secretariat of the Select Committee to suggest that they could invite SolarReserve to make a submission. Today, I rang Paul Green MLC office (Paul Green MLC is the Chair of this NSW Parliament Select Committee) to suggest that the Committee could invite SolarReserve to make a submission. The Committee can’t compel people or business/organisation entities to make submissions/contributions. I think it would be a real shame if SolarReserve declined to make a submission or provide some input/insights on solar thermal technologies to the NSW Parliament Select Committee on Electricity Supply, Demand and Prices in NSW. Today in the SMH online is an article by Cole Latimer headlined The 130 per cent power price surge that reveals a ‘broken’ market, link here. This has been a decade in the making, and we appear to now be reaping the whirlwind. Geoff, the latest Grattan report has been much in the news today. I’m not denying the magnitude of the problem, but some of the statements sounded off key. And heard nothing about the rise in the charges made by distribution networks. I’ll try to take a closer look. Our report exposes a nasty reality: new supply, whether coal, gas, or renewables with back-up to cover intermittency, is more expensive. It costs around $80 per megawatt hour or more, compared to the wholesale prices of less than $50 per megawatt hour the NEM was delivering only three years ago. Prices closer to $80 seem far more likely than $120 or $50. The NEG will help avoid the former; it will be some time yet before renewables with intermittency coverage deliver the latter. It seems the price of petrol has increased by its biggest margin in almost a decade – and the cost for motorists is expected to increase. Are we seeing the symptoms of ‘peak oil’? There’s an interesting article, dated 20 Sep 2017, about how peak oil has been hidden by the US Energy Information Administration (EIA) by including condensate and other non-transportation fuels. In recent days, Trump has asked Saudi Arabia to increase its crude oil production by an extra 2 million barrels per day (mbpd) to compensate for lower supplies from Venezuela and Iran. That’s a huge increase – it will be interesting to see if that’s possible. If Saudi Arabia can do it, then it will be the world’s largest oil producer. Saudi Arabia average 2017 production 11.951 mbpd (12.9% global share). Geoff, I saw the article by Tony Wood. Grattan have always said that renewables will cost more. They seem to say now that prices will stay about the same. I was hoping there might be some commentary at RenewEconomy, but there we have an article by Lucy Percival, originally published at The Conversation – Higher energy prices are here to stay – here’s what we can do about it. Percival is from Grattan. It’s the best outline of the report I’ve seen so far. Labor’s inherent suspicion of privatisation and markets drives calls for strong intervention; more surprising, the right of the Coalition also turns to intervention such as capping prices and various forms of renationalisation. Both responses are understandable but misguided. That may be true of some on the left but I can’t see how it’s true of Labor. The simple message coming out of the Abbott and Murdoch camp: How could anyone be so stupid as to take climate change seriously, or advocate for a single wind or solar farm? Or battery. Or load management. Who not just burn coal. They are not happy. And they are barking madly. It seems to me that the Abbott, Murdoch and “endless cast of malcontents” are entirely ideologically driven. They seem to refuse to accept any evidence/data that solar-PV and wind are now cheaper than coal, gas and nuclear power – i.e. the economic argument for renewables is now compelling, irrespective of the climate change arguments. I think for Abbott, it’s mainly about damaging Turnbull, at the expense of Australia’s energy security and prosperity – I suspect this is an opportunity for payback for losing the leadership. I think there’s a very real risk many people/businesses will become collateral damage in the “energy wars”, unless Australians wake-up and tell these “malcontents” to go away – make them impotent by making them irrelevant/ignored. Surely not! He has been so loyal. SolarReserve Solar Energy Aurora project update information can be found here.